... "Impossible", you say? Well, let me tell you that I would have reacted in the same way a few years ago. I still remember the frustration of spending nine long months in Arabic class learning the Arabic alphabet. Before I enrolled, I had already successfully learned Spanish and Latin, so I thought Arabic would be a breeze. Boy, had I been wrong! I was struggling so hard, it seemed mysterious to me how anyone could ever learn to read or write Arabic. All those little squiggles and lines just wouldn’t get into my head, no matter how hard I tried or how many times I copied out by hand each letter. 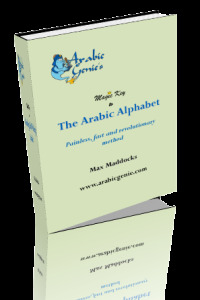 Fortunately, some eight years later, I found a revolutionary new learning technique that makes learning the Arabic alphabet effortless and enjoyable. I refined this technique into a book entitled "The Magic Key To The Arabic Alpabet".